Who's got it, talk to me, how many Teles, what are they, projects, parts, Esquires? I've got a purdy special one, and I'm working on another, and I don't even know why I'm working on another, just because. I've had a couple dozen easily but my special one I've had for over 10 years (that's like a hundred in guitar owner years ;-) is a '52 Reissue ButterScotch that was the last in a series of the same I've owned over the years. I've had one after another of these since they've been around used, same with the early Fullerton reissue Strats, had one after the other (still have an '84 Sunburst Strat, serial V00xxx), they were what was out there before the MIJ Strats/Teles of the late 80's, which everyone by now knows are pretty fantastic guitars also. I had picked it out because it was pretty incredibly naturally relic-ed, in the original case with COA from Bill Schultz (COA from CEO? ), the extra bridge, the strap, dead nuts original, it was a 1992 (extremely good years for both Gibson and Fender guitars), which was (even though Fender hardly made a big deal of it) a 50 year anniversary for the Tele, and that's what I consider it, a 50 year anniversary Tele. And to boot, there was an extra "matte" guard with it, a bakelite guard. I put that on almost instantly, curled edges and all, looks amazing. The problem was, and there's always a problem... was also that the seller forgot to mention (I didn't ask, in those days nobody cared) that this Tele was a chunky one, I mean, like a Les Paul chunky, weighing at 9lb 6oz, I never played it that much, the weight bugged me. Until I decided to do something about it. Out of the blue a non relic (rare) MJT 2 piece Butterscotch ash body weighing only 4lbs showed up on the bay, I snagged it and it went through the Polar Vortex to get here... never so glad to see a box. Swapped everything over, and I have a Tele that's under 7lbs. That's right, under 7lbs with that flamey ball bat neck. Neck weighs 1lb 8oz with tuners. Real Tele freaks know the weight of every part of a Tele right down to the weight of the 3 saddle bridge vs a 6 saddle, there's .02 oz difference, the one with the three brass saddles is heavier. The brass vs steel controversy can go on for days, and I hear Brad Paisley likes to mix and match and use Steel under the low E and A strings for added bite over the brass of his other four saddles. So I'm loving life all over again with a featherweight Tele, a 4lb 5oz D35, a 4lb 2.0oz F30, a 6lb '65 2 p'up Dano "Page" model, a 5lb 12oz 2 p'up 1960 Supro so I'm blessed with featherweight guitars. By comparison my D5CE is 6lb even, and that's a tank for an acoustic? Then some "other" Tele body popped up on eBay, with really cool p'ups, it's in the mail. Super vintage Warmoth body with ancient Seymour Duncans in it, basically some of his first p'ups. So then I needed a neck, Rosewood this time, this one's going to have a White guard/Rosewood board, neck is in the mail (a neck as unique and cool as the body), and a set of tuners (Gotoh factory aged), and a decal, etc etc, if I needed it I scored it, on eBay. Rverb seems to have a dearth of certain things, cool tidbits or whatnot. Super excited about this one, 6 saddle bridge, Alder body, oldest and coolest Warmoth body and guts I've seen on eBay in ages. Last edited by Guildedagain; 03-15-2019 at 09:45 PM. An Esquire was used by Jeff Beck for the Yardbirds' "Shapes of Things" and by Mars Bonfire for "Born To Be Wild". I have a love/hate thing with teles. I love the way they look, and I love the way they sound, but I hate playing them. I think they're about the least ergonomic guitars ever made, and yet every few years I end up trying another one. My first Tele was a G&L ASAT. I also, like GAD, like the idea of the Tele, but, as good as the guitar was I just never connected with it. Too twangy, and the neck and the scale just weren’t comfortable for my hands. 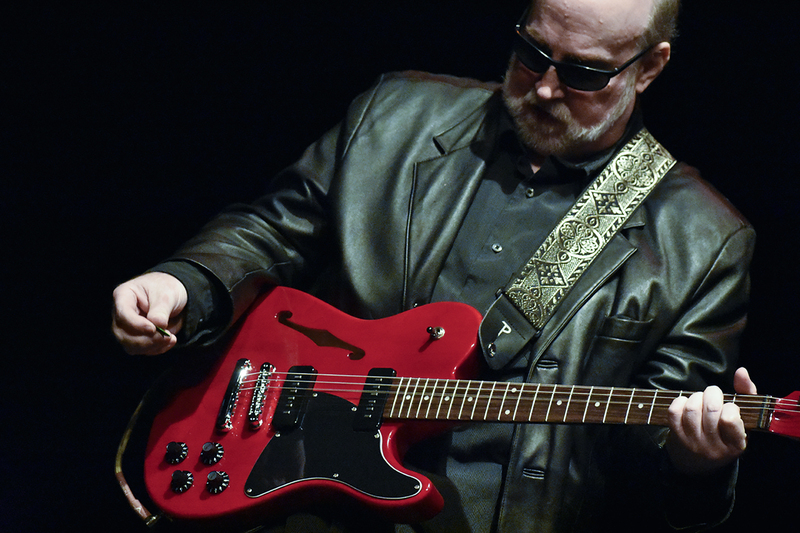 Next up was the Guild (not) Roy Buchanan T-250. Belly relief cut, thin neck, it felt a whole lot better, but the long scale left a little to be desired (again, for my hands). It found a better home in Default’s hands. Finally I found the Tele of my dreams, the Fender Jim Adkins model. It’s probably the most un-Tele Tele out there, and yet my first actually from Fender. It had its P90 pups replaced with Alnico V staple pups, and it’s short scale, with Gibson-esqe control panel and stop tailpiece. Based on the semi-hollow thinline version, it’s comfortable to play, and it’s twang it’s more subdued. It fits me and what I play. I love teles. I have a made in Japan 50's style tele with a neck I really love that I've had forever, and three homebrews (partscasters, some of which I finished in nitro) : a dark copper metallic low B-tuned baritone, a white blonde swamp ash one with two vintage Kay "Barney Kessel" pickups, and a very nice blonde one piece swamp ash one with two Lollar "50's" P90's. So not all of them are traditional teles, obviously. maple necks on all of them, btw. Yeah, what GAD said. But I do love the looks of the Butterscotch finish. 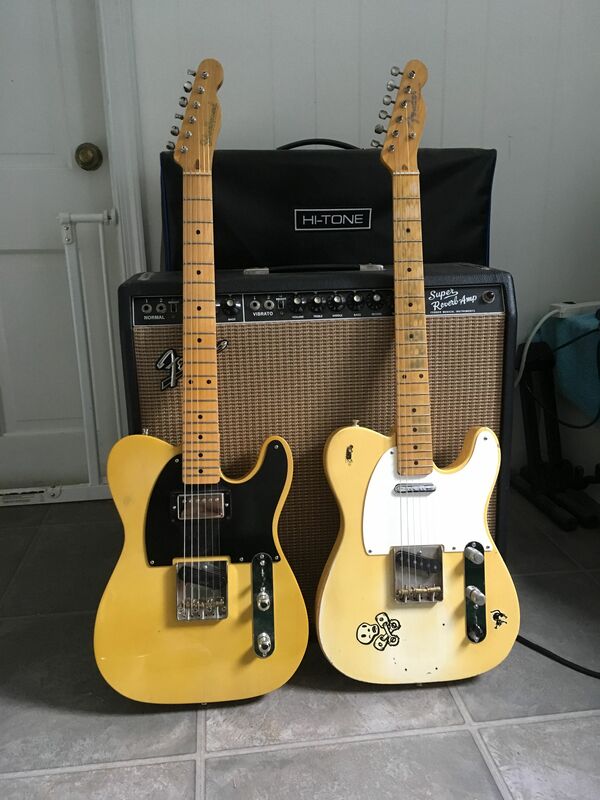 Here's two of my favorite "Teles". The one with the black guard is from Curt Wilson at Old School Lutherie in New Jersey. The body is built from 200+ year old fir that made the original rafters of the shop; it has a Warmoth neck and Duncan pickups. The white guard is a partscaster I put together from a ca. '70 Fender body, MJT neck and Peter Florance Voodoo pickups. Only solid body I ever bonded with was a Tele. Mid-60s. natural finish, RW board with a humbucker at the neck. Used it in a country band I was in, but it also had a great jazz sound. Loved the sound, but never really got comfortable with the body. Still, think about getting another one, but probably never have a need for one. Some time of my favorite guitarists play teles; but they’re not for me. Like GAD, I try one every few years. I was just thinking today that I’m gonna sell the one I have now. If I ever came across a ‘magic’ one, I might change my mind. P.S. I HATE the P/U switch. One look at a black guard Tele, even with a PAF in the neck position, and to me it just screams "the" quintessential electric guitar.